You don't really care who made this, and to be honest, neither do I. So instead here's a snarky rebuttal to the above poster about stock footage never being extinct either. No "Guilty Pleasure Quality" this time. I really hate this movie. Only in the category for consistency's sake. 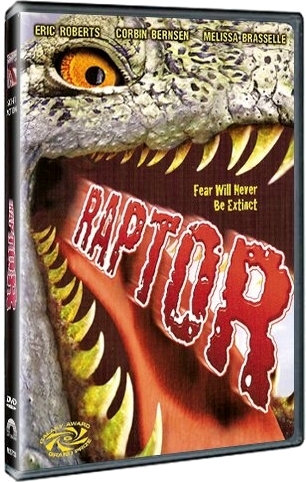 I’m really not sure how to introduce Raptors, the 2001 spin-off film following the Carnosaur Trilogy. Other than that it’s low production values and mindless casting were even too much for me, as I’m knocking this film out of The Guilty Pleasures. That’s right. It was so bad I couldn’t even enjoy it as cheap and silly entertainment. The way it was shot, the way the actors walked, and the clues to major cop-outs later on down the film just turned me off from the very beginning. I would say that Roger Corman should have stay Executive Producer rather than moving to Producer for the film, but that would suggest the other Carnosaur films were any good. Raptors was just as bad but simply far less enjoyable.